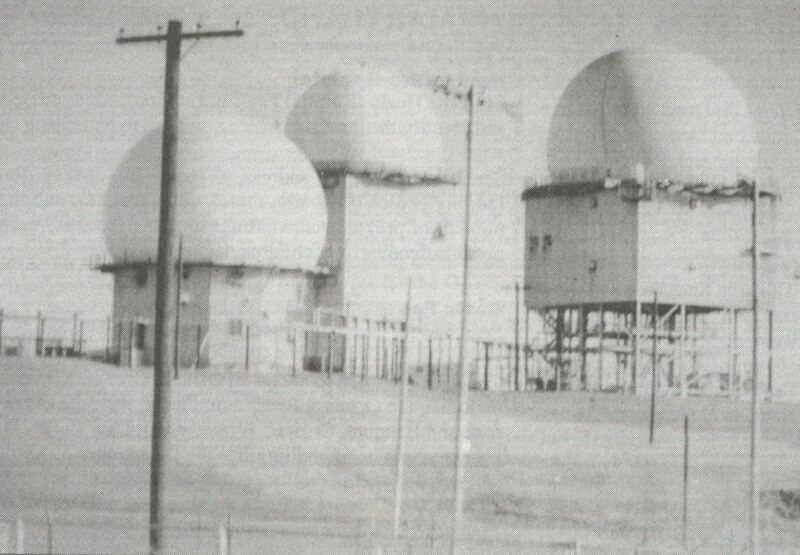 1) Closeup of radar facility on highpoint: The heart of the 664th AC&W Squardron are (Left to RIght) the Army/Navy Fixed Point Station radar sets ANFPS-6 which determines altitude, ANFPS-27 (search) and ANFPS-26 (altitude). 2) If you think access to the highpoint is tough now, this is what it was like during the heyday of the 664th AC&W Squadron. 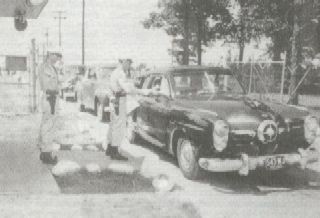 The phot was taken at an open house hosted June 15, 1952. 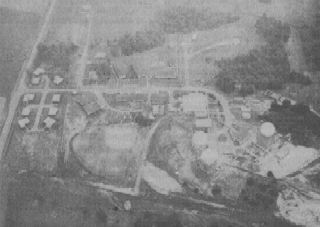 3) Aerial view of Campbell Hill Showing radar installations: The 664th AC&W Squadron circa 1954. The highpoint is located between the radar stations and the softball field. The author palyed on a much improved version of the softball field in the early 1970's. The field, which no longer exists, was a favorite among the local softball players, not because of the "thinner" air but because of the prevailing winds over the highpoint ridge. Roger Rowlett describes Campbell Hill’s “relatively steep west face leading to the obvious summit” and refers to it as ‘the most manicured of the state highpoints.” Now it’s time for the rest of the story. Campbell Hill is located on the eastern edge of Bellefontaine, Ohio, approximately 50 miles northwest of Columbus. At an altitude of 1,549’, ‘the hill” is 43rd in height of the 50 state highpoints and is located on the grounds of the Ohio High Point Career Center. Geologically, Campbell Hill is classified as a glacial moraine. During the Pleistocene Era, which extended from 1 million to 10,000 years ago, glaciers covered the majority of Ohio. As these glaciers retreated northwards at the end of this era they left large deposits of glacial till (boulders, clay and gravel) in their wake. The effect is similar to a snowplow that leaves a big pile of snow at the end of your driveway as it plows the street. Local records show that Solomon Rogue of Virginia secured a tract of 1,000 acres from the governemt in 1830. Solomon disposed of most of the land soon thereafter, and his nephew John Rogue secured 100 acres in the middle of this tract, including the highpoint. The highpoint was known as “Hogue’s Hill” until it was sold to Bellefontaine resident Charles D. Campbell in 1898. “Campbell’s Hill” was in turn sold to beer magnate August Wagner in 1937. Wagner died in 1944 and left the tract to his daughter helen. Helen deeded the highpoint and the surrounding 52 ‘/2 acres to the Federal Government in 1950. Later that year the government began construction of a radar station that was to become a primary player in our nation’s Cold War strategy. The next year the Air Force opened the 664th Aircraft Control and Warning Squadron as part of the U.S. Air Defense Command. Its purpose was to monitor the skies for enemy planes and possible air attacks. The base also aided friendly aircraft in need of navigational assistance and other functions. Upon completion of the “Green Line” in northern Canada, the base was deemed obsolete and was closed in 1969. The vacated site was ceded to the Ohio High Point Joint Vocational School and classes began in the former air base buildings in the fall of 1974. Meanwhile, a 120,000 square foot main building was constructed and classes began there in 1975. The campus now consists of one main building and 22 auxiliary buildings. The public has access to thecampus and the highpoint during the week, but the main gate isclosed on most weekends and holidays. Arrange-ments can be made for access, or there is a pedestrian gate at the maine ntrance and the high-point is a short walkaway. There is a flagpole, monument and USGS marker at the summit. Though there is a beautiful view from the highpoint, most visitors express disappointment in seeing not an abrupt cliff or peak, but instead a gently rolling elevation on along ridge. For those looking for more of a challenge, the author suggests packing a bicycle for a ride on the Top of Ohio Bicycle Trail. This is a 47-mile loop trail, signed for counterclockwise travel, over the many glacial moraines in eastern and southern Logan County. Access is from anywhere on the trail, but an easy starting point is at the High Point Village Shopping Center about 1/2 mile west of the highpoint, where there is ample parking. Maps are available in the County Commissioner's Office on the ground floor of the Logan County Courthouse in downtown Bellefontaine. Campbell Hill was recently designated as a State Historic Site by the Ohio Historical Society in anticipation of Ohio’s bicentennial celebration in 2003. The Ohio Historical Society, the Treaty Lands Chapter of the Professional Land Surveyors of Ohio, and the Ohio High Point Career Center will soon erect a new marker designating the highpoint as a historic location.